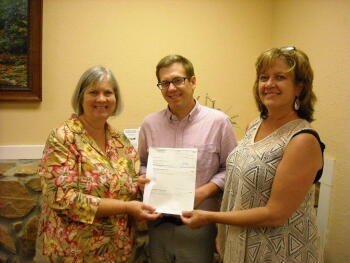 The Swain County Community Foundation presented the 2014 grants from its Community Grantmaking fund at a gathering on June 17th at the Business Commons office complex in Bryson City. This year awards went to Barium Springs - First in Families project and Prevent Blindness - Star Pupils program. Pictured below left to right: SCCF Board Member, Christine Colcord, Stephen Fletcher, First in Families, and SCCF Board Member, Mary Anne Baker.